Over the past several months, Kwesé Gamer has been running the group stages for the ESL African Championship. It began with Season 1, where teams from North and South Africa competed for a spot at the finals. Only four teams would make it to rAge, two from the North and two from the South. rAge will once again be the home for South African esports in October, with ESL’s CS:GO Championship adding to the main floor attractions. “Celebrating its 15th anniversary from 6 – 8 October 2017, Every year, you can largely expect more of the same – plenty of brand-new games, an incredible amount of playable titles and a host of activities for visitors. But one thing that will be vastly different this year, is that Kwesé Gamer will officially have exhibition space. Not only that, but clocking in at over 500 square meters it will be one of the largest at this year’s expo. The massive arena erected by Kwesé Gamer will host the ESL African Championship finals, where the top two teams from the South African and North African group stages will battle it out to be crowned Africa’s ESL CSGO champion. With seating for many eager South African esports fans, visitors will be able to watch all the action on massive screens on the side of the stage. Kwesé will also be hosting a Hearthstone competition, similar to what we saw at the RUSH Esports festival. “If CSGO is a bit too fast-paced for passers-by, Kwesé Gamer will once again host a Hearthstone Fireside Gathering on Saturday 7 October. The top three players on the day will go head-to-head to win their share of R10 000. As part of the ESL African Championship, the Hearthstone portion’s finals will also be played at rAge, while the action will be broadcast live on Kwesé Gamer’s Facebook page and Twitch channel. 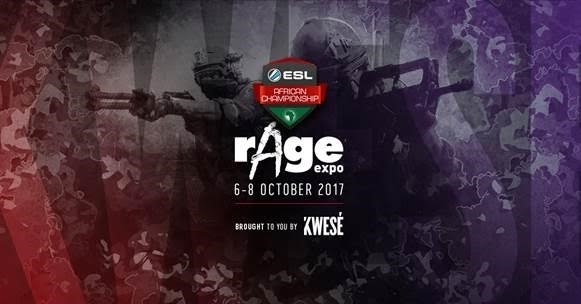 The ESL African Championships will be one of many esports attractions at rAge this year as the annual rAge expo becomes more and more welcoming to the growing industry. Last year rAge had three main esports attractions, and in 2017 more space has been allocated to professional competitions with larger prize pools.